The Canon PowerShot SX130 Digital Camera has a 12.1MP sensor, a 12x zoom lens (28-336mm equivalent in 35mm, which goes from very wide-angle to super telephoto in a snap), and a vivid 3″ display. That’s just the basics–there’s also dazzling 720p HD video with stereo sound, fun special effects like Fisheye and Miniatures, and Advanced Smart AUTO that gives you the absolute best exposure for 28 different shooting situations. The good: Excellent photo quality, features for its class; semimanual, manual shooting modes; uses AA-size batteries. The bad: Slow shooting performance; bulky, heavy body. The bottom line: The budget-friendly Canon PowerShot SX130 IS is a solid, compact megazoom for those who prize creative control and photo quality more than fast shooting performance or a small, lightweight design. 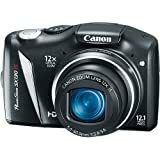 The PowerShot SX130 IS is one of Canon’s three compact megazooms for 2010. It shares some of the same features as its linemate, the SX210 IS, mainly semimanual and manual shooting modes and 720p HD movie capture. However, that model has a longer, 14x zoom lens and a 14-megapixel CCD sensor to the SX130’s 12x zoom and 12-megapixel CCD sensor. Then there’s the PowerShot SD4500 IS, which is part of Canon’s Digital Elph line and features a 10x zoom and a 10-megapixel CMOS sensor. Despite having the midrange specs of the three, the SX130 IS is the most basic and lowest priced. It’s also a very good camera for those wanting more creative control than just about any competing model will give you and excellent photo quality for its class. Its shooting performance is the only thing that’s lackluster here, but it’s still on par with similarly priced models. For the last 2 years I’ve been searching for a camera to be a companion to my Sony DSC 7.2 megapixel (bought in 2005) which takes awesome pictures even when enlarged and the color is just phenomenal! I wanted something with zoom power, neat features to play around, and of course must provide awesome color. Panasonic ZS1…awful, awful pictures. So noisy/unclear it was unbelievable. Sony DSC W290…noisy/unclear. Sony really went the way of the dodo on this one. Sony TX5 ($350)…again, just not as clear as my old 7.2 megapixel. Sony DSC H55…almost a keeper, but still not as good as my old 7.2 megapixel. Finally I tried this Canon and I bought it as soon as it came out, before any reviews were posted. I was simply hoping that the technology this year would be perfected and I would not find the same noisy/low-light/poor-light performance problems that every camera I read about on Amazon seems to have had in the past 3 years. WELL I HIT THE JACKPOT! 1) Print up the manual (at home, and trim it to size) then have FedEx/Kinkos spiral bind it for $8. 2) Set aside 1 to 2 full hours (completely undisturbed) and read the manual. It’s a very good manual and pretty thorough. 3) This really is not a camera for people who just want to keep it on “auto” all the time and snap away. Because this camera really only shines when you learn how to work it and play with it’s settings, which are easy to learn and numerous. This camera is fun and provides many, many fun options. NOTE: I am not a camera pro, and at my age learning how to work and remembering new technology can be a task, but this camera makes me feel like a camera pro, and I must reiterate it is easy to learn/navigate. This camera has way too many cool features to cover, but I’ll highlight some. 1) Takes photos automatically when someone smiles. 2) Has a “wink” self-timer. 3) Customizable self-timer. You can set the self timer to take as many photos as you want, at intervals of time, for example you can tell it take 30 photos in 3 second intervals, or whatever combo of numbers. Very cool feature! 4) Takes a photo when a “new face” enters the picture. So you can set it on a tripod to take pics of a gathering and when new faces enter the scene it just keeps snapping away. 5) SCENE OPTIONS: Lowlight, Vivid Colors, Poster Effect (old/worn look), Accent color (keep only one color and make others B&W), Color Swap (I changed my black appliances to my wood cabinets and vice-versa), Fisheye Effect (very funny), Miniature Effect (blurs top and bottom with a clear center), Beach Scene (for sunshine/good blues), Foliage (for vivid foliage), Snow Scene, Fireworks. 6) LIGHTING: You can set white balance, tell it the lighting around you like flourescent, daylight, cloudy, et al. 7) COLOR: You can set color saturation to vivid, neutral, sepia, B&W, positive (like silver-tape movies), light skin tone, dark skin tone, vivid blue, green, red, and even completely customize even more than this. 8) SHOOTING: It’ll take one shot, or continuous shots. 9) FLASH: You can set your flash power. And you raise it manually or hide it if not needed. 10) QUALITY/SIZE: Obviously you can set size/quality of photos. 11) OTHER: You can set shutter speed, aperature, both together, ISO from 80-1600, AND SO MUCH MORE! 12) MOVIES: Very clear video recording…I was amazed! 13) MORE AUTO SETTINGS: Kids & Pets, Landscape, Portrait, Easy, Auto. 14) And “within” all of these setting mentioned you can do more things, for example, if you’re on Auto or Easy or Portrait you can tell it to take continuous shots, or self-timed at intervals, and on and on. 15) And this camera still offers even more features than what I listed!!! 1) With every selection, with every turn of the dial, every press of the button, a clear and easy explanation of what you are doing or selecting appears on the screen. You simply cannot make a mistake. It ate through my Duracells within hours. So I purchased Sanyo Eneloop Rechargable Batteries and they seem to be lasting longer and better. But it is nice to have the ability to buy AAs when needed and not need an outlet to recharge, so I liked that feature. At sunset of people in backyard: Clear and vivid and picked up green palm trees, tan skin, etc. At 1am of people on porch: Clear and vivid and picked up everything as though it was daylight. In dark living room: Clear and vivid and picked up wood chest, painted wall, everything as though the lights were on. Landscapes during the day: Just awesome! Pool/foliage during the day: Again, amazing color and clarity…and did I mention amazing color! DO NOT BE OVERWHELMED OR INTIMIATED BY THIS CANON CAMERA AND ITS FEATURES. 1) Can’t find a “setting,” it’s because I forget to turn the dial to “SCN” which will then allow me to pull up the menus I’m looking for. 2) Can’t access the ISO Speed, White Balance, Tone/Color Change, I forget to turn the dial to “P” which then gives me the menus for those. 3) Not getting a flash, I forget to manually raise the flash bulb. Yes, you just flip it up with a finger, or flip it down to hide it. If you read the manual, this camera will make you feel like a professional photographer and provide endless enjoyment and fun making memories! I first heard about the SX130is on August 19th- the same day I had decided that my final purchase decision would be the SX120is. After reading a few reviews, it had me convinced that this would be worth waiting for. I received my SX130is late this morning- and have to say, right from the box it was just amazing. Every time in the past when purchasing a new camera, it takes some adjusting and “breaking in” before fully great-quality pictures come, but with this one, literally from the first shot it has been wonderful. The HD video also records wonderfuly, and the sound is great as well- even with using all of the 48x digital zoom! The one “downside” to the video mode is that the image doesn’t auto-focus as you zoom in, at times you have to re-focus using the shutter just as you normally would when taking a picture, but I personally didn’t find that too annoying once I figured it out. The miniature and fisheye modes are a blast to use, and the smart-shutter mode (takes the photo when a smile is detected, without using the shutter) is neat too. The LCD is a nice big size, and has an auto-rotate for images in the playback mode, as well as an option to scroll through them when selecting. A fun fact which I also noticed is that it has a “screensaver,” which displays the time to save the screen (as a computer would). Although some might consider it a bit “bulky” compared to most compact point and shoots, the size is perfect for someone like me who has bigger hands, allowing for a decent grip and non-clumsy hold. Overall, I just absolutely LOVE this camera (which I why I already give it 5 stars, hands down). Definitely recomend this to anyone; is well worth the money! After finally getting some Rayovac recharcable NiMH batteries, I can finally say that this camera is well worth the money. If you use regular AA (nonrechargeable) batteries, it will blow through them like crazy, so I learned the hard way. But the NiMH last much, much longer, plus are rechargeable. If you plan on purchasing this camera, I would highly recommend also getting the batteries- it is well worth the extra money. I was looking for a new camera to replace my 4 year old canon a630, 8mp, 4x zoom before our vacation next month. I was going to go with the sx120is, but it did not have HD video like all the other cameras had on them. Will I use that much, maybe, maybe not, but I at least wanted that option since all the other new cameras have it. Then I found out why the sx120is was going down in price, to make way for the sx130is. I looked everywhere and no one had it in stock yet. Then amazon got it a couple days later and I ordered it. Right away I thought it looked great. Very nice, something to hold onto, unlike the new small size cameras-I just don’t like that they are so tiny. Love the big screen on the back. I thought I would miss not having a viewfinder and only using the rear display, but then i thought about it-I only use the display anyways on my camera and never the viewfinder! Sometimes the display looks grainy when not enough light, but after seeing the shot I just took, the pic was perfect. I like that it uses 2 AA batteries since I use rechargables-my other one used 4, so I have 2 extra for a backup now. I love how it zooms in on the face and the smile shutter is a neat trick. Have not played with the hd video yet, but I would have liked a mini-hdmi out of the camera. Also would like the flash to pop up on its own instead of saying on the screen to put the flash up. Other than that, there are so many controls, I’ll probably never use them all and mainly use it on auto, which is great! The 12 MP and 12x optical zoom is great. Just note the 4x digital zoom does not work in widescreen mode, but it never did on my other camera either. A great camera to get without paying the extra money for the D-SLR cameras. I previously had the SX110 model and I loved that camera. I am loving the 130 just as much. The photos I get from this camera are amazing, and that’s on Auto mode. Loving the Fisheye and Miniature settings too. Of course the thing I love most is the optical zoom(on this model, it’s 12x). I also like that the camera takes AA batteries. I have a DSLR as well but this camera will be my go to camera, much like the 110 was. For $249, you get a lot.Like I said, you can use the Auto mode, but you can utilize manual settings once you start feeling more confident. I liked the Canon SX120IS but did not buy it because it could not zoom optically during videos and did not have HD video capability. I looked at other cameras from Panasonic and Sony but they had limitations as far as I was concerned. Any photographic product has trade offs but this is a camera that will satisify most users. I got the powershot SX130IS for christmas and i can’t figure out how to use the fisheye effect. could someome PLEASE help me out? i’d be very grateful.